A view athort the Brahmaputra near Sukhleswar Ghat, Guwahati, Assam, Indie. Cairt o the combined drainage basins o the Brahmaputra (violet), Ganges (orange), an Meghna (green). 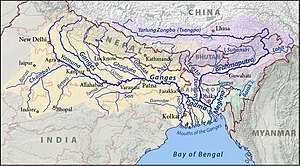 The Brahmaputra ([brɔmmɔput̪rɔ nɔd̪]), also called Tsangpo-Brahmaputra, is a trans-boondary river an ane o the major rivers o Asie. It is the tent lairgest river in the warld bi discharge, an the 29t langest. ↑ Michael Buckley (2015-03-30). "The Price of Damming Tibet's Rivers". New Delhi: New York Times. p. A25. Archived frae the oreeginal on 2015-03-31. Retrieved 2015-04-01. Two of the continent’s wildest rivers have their sources in Tibet: the Salween and the Brahmaputra. Though they are under threat from retreating glaciers, a more immediate concern is Chinese engineering plans. A cascade of five large dams is planned for both the Salween, which now flows freely, and the Brahmaputra, where one dam is already operational.